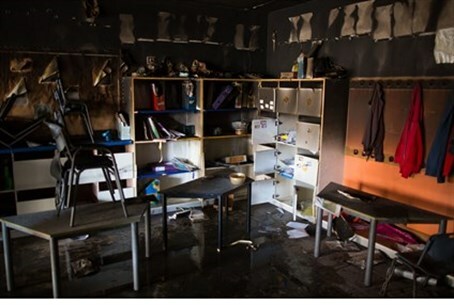 ISA says suspects aged 18-22 torched Jewish-Arab school because of anti-assimilation ideology. Lehava: we only operate legally. Three activists from the Lehava organization have been arrested on suspicion of setting fire to a kindergarten at the bilingual Max Rayne Hand in Hand Jerusalem School two weeks ago, and the Israel Security Agency (ISA, or Shin Bet) claims that they have confessed to the crime. The investigation was under a gag order until now. The three suspects are Yitzchak Gabai, 22, of Jerusalem, Shlomo Tuito, 20, of Beitar Illit, and his brother Nahman Tuito, 18, also of Beitar Illit. They allegedly carried out the attack because the school is one in which Arabs and Jews study together, something they are opposed to. They wanted to bring the issues of Arab-Jewish “coexistence” and assimilation into national focus, on the public and media level, according to the ISA. The ISA noted that Lehava is inspired by the teachings of Rabbi Meir Kahane, and that besides the arson, the suspects also sprayed the slogans “Kahane was right” and “there is no coexistence with a cancer” on walls. "This grave act is the latest in a slew of violent activities in which Kahanist members of Lehava were involved recently,” claimed the ISA. Attorney Itamar Ben Gvir, who represents the suspects, said that the confessions were coerced and that he would work to have them disqualified. He and another lawyer for the suspects met the suspects after five days of ISA interrogations, he said. “We found [that the suspects had suffered] severe abuse, sleep deprivation and psychological pressure,” he said, and cited threats allegedly uttered by ISA investigators against the suspects.